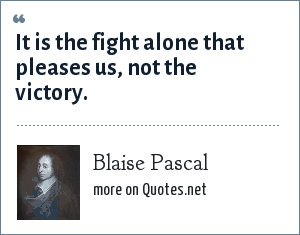 Blaise Pascal: It is the fight alone that pleases us, not the victory. "Blaise Pascal Quotes." Quotes.net. STANDS4 LLC, 2019. Web. 23 Apr. 2019. <https://www.quotes.net/quote/16243>.